About The pheasant in my garden. Well Wolf. Now that you brought it up, I haven't seen the roadrunner for quite a while either. Oh no. I am still not outdoor this year, it is an older shot from last year 2014 or 2013. Dank je wel Riny. Hij liep rond het huis dus ik kon hem vanuit de woonkamer zo fotograferen. 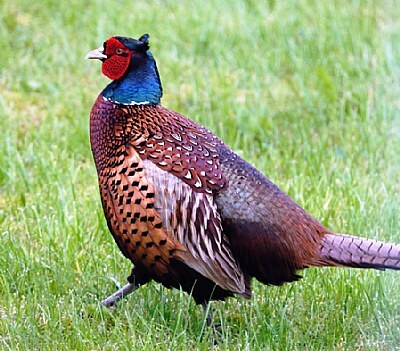 Nice photo of this colourful bird Harry (very pheasant). Beautiful photo of a beautiful pheasant! I haven't seen pheasants on our property in quite a long time. Very nice detailed shot of the pheasant here Harry! exposure. Lovely colors with good center of interest. very nice shot dear Harry. Aware of its beauty, is very proud. Wat een mooie opname van deze fazant. Prachtig die kleuren ook, ook mooi zo tussen het korte groene gras. Knap gedaan hoor, want meestal vliegen ze meteen weg zodra ze je in de gaten hebben.